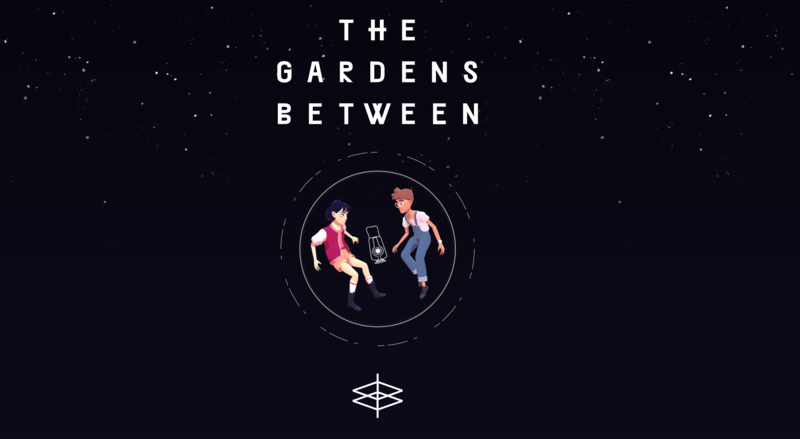 There’s a large audience for The Gardens Between, but I may not be one of them. 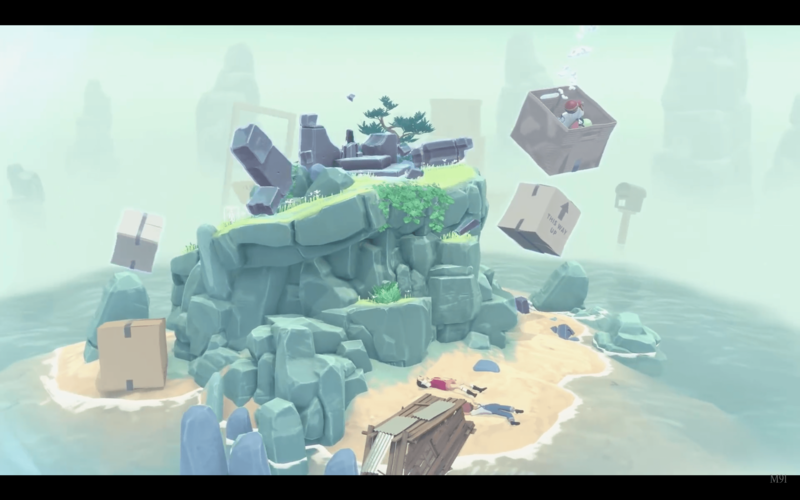 It’s an adventure puzzle game that was pleasant at times and trying at others, but not so trying that it was impossible. Back in the mid to late 80s, two children by the name of Arina and Frendt, are playing in their treehouse. The rain is coming down, and the sounds of subway trains pierce the early night. Suddenly a ball of light appears. 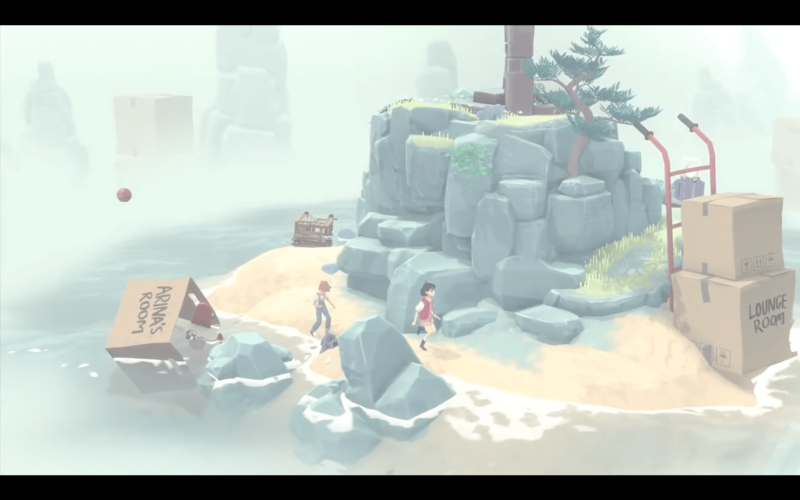 Upon touching it, Frendt and Arina are transported to a magical world along with part of their treehouse, washed up on the shores of the small island, a mountain in front of them and with no way to escape unless they complete the mountain’s puzzles. The controls are quite simple: as I move the controller forward, my characters do the same, sort of. It’s not so much the characters are being moved as much as time itself is moving backward and forwards depending on how long I hold down the joystick. The island will move, along with the characters, as time is moved, with little control of the characters themselves. Besides backward and forwards the only button used, an “A” on my Xbox One, decides whether or not to interact with the items around me. Each puzzle involves getting to the top of the mountain with an orb of light similar to the one that transported you to this world. But it is not as simple as walking up the mountain, as numerous items will block your path, and you’ll have to find just the right moments to decide where and how to interact with the environment. The game itself, if you know exactly what you’re doing, can be played in around an hour’s time. But very few will manage that. Most of the puzzles themselves are self-explanatory, but at least once on every island, there was a point at which I would stare blankly at the screen, and issue one or more profanities. No matter how relaxing the game music is, nothing is going to stop me from staring and swearing sometimes. And the music is incredibly relaxing. With soothing electronic beats that you might listen to if you were studying for a test, it never gains intensity. It’s pleasant and fits the tone of the game perfectly. The same can be said of the graphics. Experiencing the characters, and the way they interact with the environment, in their limited controls, is where it’s at. 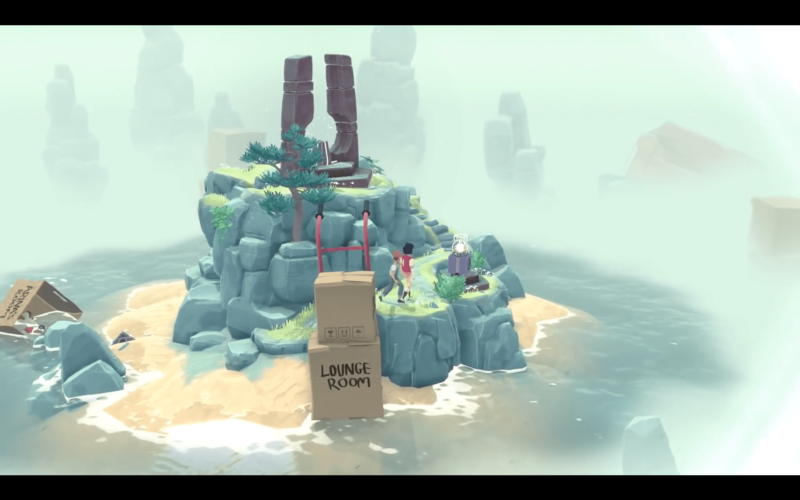 The game begs you to do more than solve puzzles and play with time; it beckons you to pause and appreciate the beauty of your surroundings. The islands are beguiling, and filled with items from the characters’ lives in the real world. I had two favorite islands. One of them included video games on an old standard definition color TV, a game within a game. As part of the game, your goal is to get the character on the TV to help the orb of light get out of the TV and into the character’s world. It was completely charming. Another involves putting together and taking apart a dinosaur skeleton which hugs the island. As I moved backward and forwards in time, putting the bones in the right spots, using them as bridges to move around, I felt a pleasant satisfaction. It’s just a clever piece of work. With simple, but effective, character designs, the characters have a perfect cartoonish charm to them. 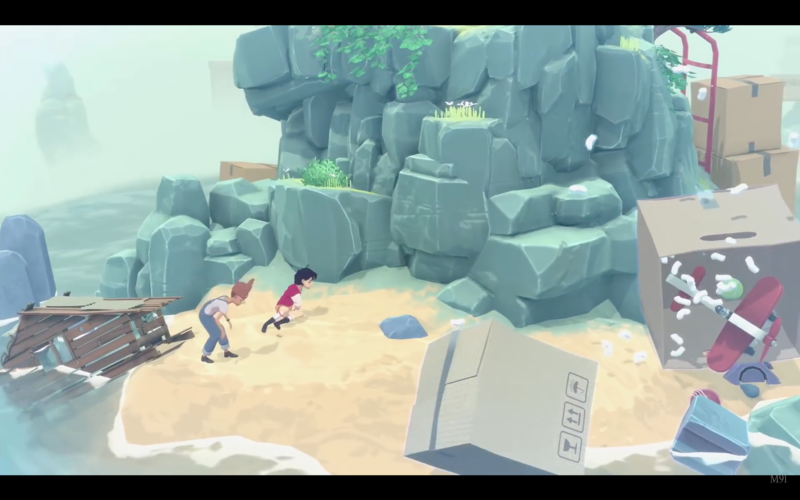 Upon completing a certain amount of the game’s puzzles, you’ll see how all the items you’ve played with while climbing the mountain, are actually a part of the children’s lives in the real world, whether that’s a dinosaur skeleton, an old TV, or a “Walkman” and headphones. It’s touching. Like most good indie games, watching it, you get the feeling that genuine heart was put into this project. The game isn’t perfect though. First of all, it is incredibly short; but at $13.99 on Steam, and with 30% off, it doesn’t have to be Final Fantasy. The other problem is that, at times, it can start to feel a bit repetitive. No two islands are especially the same. In fact, they are all fairly unique, one from another, but going around in a circle and having little direct control of a character can sometimes go from relaxing to boring. It’s always pretty to look at, but sometimes it’s just not as fun as I wish it could be. The game is well-acclaimed, having received numerous awards for its work. And with a 9/10 on Steam and a 79% cumulative score on Metacritic, this game is obviously going to have its fans out there. If you’ve been wanting to play this game, give it a go. On Xbox Game Pass, it’s a part of your monthly subscription. The puzzles, while not hard, can occasionally be annoying. However, most of them, like any good puzzle game, give you that “AHA!” moment. Some of them, (insert profanity here), depended on seemingly perfect accuracy, which can be very frustrating. This game has an audience out there, and people interested in a “puzzle adventure” game are probably not going to be disappointed. But people who are more action-oriented may find the game tedious. You’ll either love it or hate it. It’s the kind of game I can look at as a piece of art, and have a good idea of what was intended, and appreciate it for that. 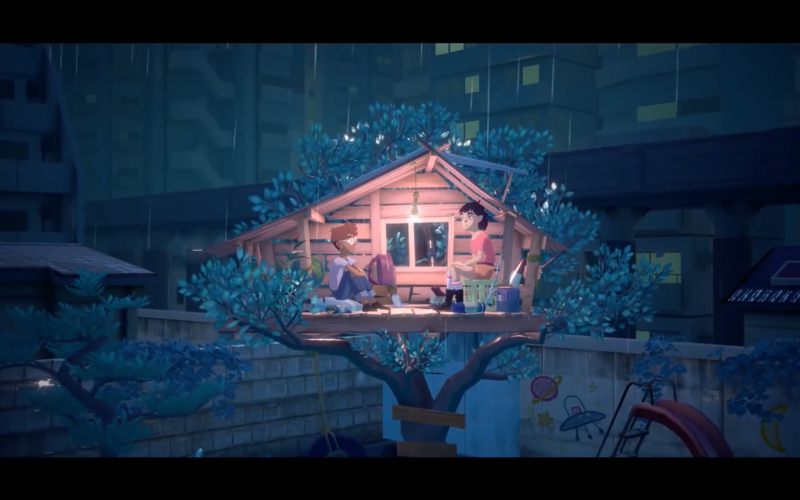 While lacking any actual dialogue, watching the way the characters silently “talk” and signal to each other is charming. You can tell the makers of this put a lot of heart into the game. Limited replay value. Once the puzzles were completed, I didn’t feel a need to play it again. Bring a friend if you’re going to play this. Puzzles can sometimes be obnoxiously confusing.